Primary food processing is necessary to make most foods edible, and secondary food processing turns the ingredients into familiar foods, such as bread. Tertiary food processing has been criticized for promoting overnutrition and obesity, containing too much sugar and salt, too little fiber, and otherwise being unhealthful. Primary food processing turns agricultural products, such as raw wheat kernels or livestock, into something that can eventually be eaten. This category includes ingredients that are produced by ancient processes such as drying, threshing, winnowing, and milling grain, shelling nuts, and butchering animals for meat. It also includes deboning and cutting meat, freezing and smoking fish and meat, extracting and filtering oils, canning food, preserving food through food irradiation, and candling eggs, as well as homogenizing and pasteurizing milk. Contamination and spoilage problems in primary food processing can lead to significant public health threats, as the resulting foods are used so widely. However, many forms of processing contribute to improved food safety and longer shelf life before the food spoils. Commercial food processing uses control systems such as hazard analysis and critical control points (HACCP) and failure mode and effects analysis (FMEA) to reduce the risk of harm. Baking bread is an example of secondary food processing. Secondary food processing is the everyday process of creating food from ingredients that are ready to use. Baking bread, regardless of whether it is made at home, in a small bakery, or in a large factory, is an example of secondary food processing. 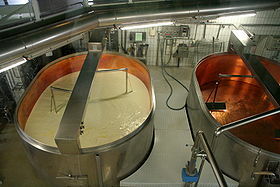 Fermenting fish and making wine, beer, and other alcoholic products are traditional forms of secondary food processing. Sausages are a common form of secondary processed meat, formed by comminution (grinding) of meat that has already undergone primary processing. Tertiary food processing is the commercial production of what is commonly called processed food. 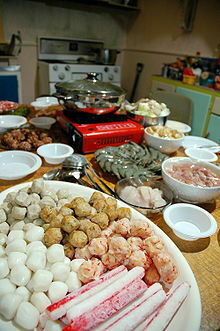 These are ready-to-eat or heat-and-serve foods, such as TV dinners and re-heated airline meals. Modern food processing technology developed in the 19th and 20th centuries was developed in a large part to serve military needs. In 1809 Nicolas Appert invented a hermetic bottling technique that would preserve food for French troops which ultimately contributed to the development of tinning, and subsequently canning by Peter Durand in 1810. Although initially expensive and somewhat hazardous due to the lead used in cans, canned goods would later become a staple around the world. Pasteurization, discovered by Louis Pasteur in 1864, improved the quality and safety of preserved foods and introduced the wine, beer, and milk preservation. In the 20th century, World War II, the space race and the rising consumer society in developed countries contributed to the growth of food processing with such advances as spray drying, evaporation, juice concentrates, freeze drying and the introduction of artificial sweeteners, colouring agents, and such preservatives as sodium benzoate. In the late 20th century, products such as dried instant soups, reconstituted fruits and juices, and self cooking meals such as MRE food ration were developed. By the 20th century, automatic appliances like microwave oven, blender, and rotimatic paved way for convenience cooking. Processed foods are usually less susceptible to early spoilage than fresh foods and are better suited for long-distance transportation from the source to the consumer. When they were first introduced, some processed foods helped to alleviate food shortages and improved the overall nutrition of populations as it made many new foods available to the masses. Processing can also reduce the incidence of food-borne disease. Fresh materials, such as fresh produce and raw meats, are more likely to harbour pathogenic micro-organisms (e.g. Salmonella) capable of causing serious illnesses. The extremely varied modern diet is only truly possible on a wide scale because of food processing. Transportation of more exotic foods, as well as the elimination of much hard labor gives the modern eater easy access to a wide variety of food unimaginable to their ancestors. Processing of food can decrease its nutritional density. The amount of nutrients lost depends on the food and processing method. For example, heat destroys vitamin C. Therefore, canned fruits possess less vitamin C than their fresh alternatives. The USDA conducted a study of nutrient retention in 2004, creating a table of foods, levels of preparation, and nutrition. Using some food additives represents another safety concern. The health risks of any given additive vary greatly from person to person; for example using sugar as an additive endangers diabetics. In the European Union, only European Food Safety Authority (EFSA) approved food additives (e.g., sweeteners, preservatives, stabilizers) are permitted at specified levels for use in food products. Approved additives receive an E number (E for Europe), simplifying communication about food additives included in the ingredients' list for all the different languages spoken in the EU. As effects of chemical additives are learned, changes to laws and regulatory practices are made to make such processed foods more safe. Food processing is typically a mechanical process that utilizes extrusion, large mixing, grinding, chopping and emulsifying equipment in the production process. These processes introduce a number of contamination risks. Such contaminates are left over material from a previous operation, animal or human bodily fluids, microorganisms, nonmetallic and metallic fragments. Further processing of these contaminates will result in downstream equipment failure and the risk of ingestion by the consumer. Example: A mixing bowl or grinder is used over time, metal parts in contact with food will tend to fail and fracture. This type of failure will introduce into the product stream small to large metal contaminants. Further processing of these metal fragments will result in downstream equipment failure and the risk of ingestion by the consumer. Food manufacturers utilize industrial metal detectors to detect and reject automatically any metal fragment. Large food processors will utilize many metal detectors within the processing stream to reduce both damage to processing machinery as well as risk to consumer health. One of the main sources for sodium in the diet is processed foods. Sodium is added to prevent spoilage, add flavor and improve the texture of these foods. Americans consume an average of 3,436 milligrams of sodium per day, which is way more than the recommended limit of 2,300 milligrams per day for healthy people, and more than twice the limit of 1,500 milligrams per day for those at increased risk for heart disease. While you don't need to limit the sugars found naturally in whole, unprocessed foods like fresh fruit, eating too much added sugar found in many processed foods can increase your risk for heart disease, obesity, cavities and Type 2 diabetes. The American Heart Association recommends women limit added sugars to no more than 100 calories, or 25 grams, and men limit added sugars to no more than 155 calories, or about 38.75 grams, per day. Currently, Americans consume an average of 355 calories from added sugars each day. Processing foods often involves nutrient losses, which can make it harder to meet your needs if these nutrients aren't added back through fortification or enrichment. For example, using high heat during processing can cause vitamin C losses. Another example is refined grains, which have less fiber, vitamins and minerals than whole grains. Eating refined grains, such as those found in many processed foods, instead of whole grains may increase your risk for high cholesterol, diabetes and obesity, according to a study published in "The American Journal of Clinical Nutrition" in December 2007. Foods that have undergone processing, including some commercial baked goods, desserts, margarine, frozen pizza, microwave popcorn and coffee creamers, sometimes contain trans fats. This is the most unhealthy type of fat, and may increase your risk for high cholesterol, heart disease and stroke. The 2010 Dietary Guidelines for Americans recommends keeping your trans fat intake as low as possible. Processed foods may actually take less energy to digest than whole foods, according to a study published in "Food & Nutrition Research" in 2010, meaning you retain more of the calories they contain. Processed foods also tend to be more allergenic than whole foods, according to a June 2004 "Current Opinion in Allergy and Clinical Immunology" article. Although the preservatives and other food additives used in many processed foods are generally recognized as safe, a few may cause problems for some individuals, including sulfites, artificial sweeteners, artificial colors and flavors, sodium nitrate, BHA and BHT, olestra, caffeine and monosodium glutamate. ^ Grumezescu, Alexandru Mihai; Holban, Alina Maria (2018-04-08). Food Processing for Increased Quality and Consumption. Academic Press. p. 430. ISBN 9780128114995. ^ a b c d e f Hitzmann, Bernd (2017-08-11). 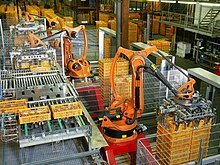 Measurement, Modeling and Automation in Advanced Food Processing. Springer. pp. 30–32. ISBN 9783319601113. ^ a b c Ionescu, Gabriela (2016-05-25). Sustainable Food and Beverage Industries: Assessments and Methodologies. CRC Press. p. 21. ISBN 9781771884112. ^ a b US Congress, Office of Technology Assessment (June 1987). "Chapter 8, Technologies Supporting Agricultural, Aquacultural, and Fisheries Development". Integrated Renewable Resource Management for U.S. Insular Areas: Summary. Washington, DC: US Government Printing Office. pp. 278–281. ISBN 9781428922792. ^ Hui, Y. H. (2012-01-11). Handbook of Meat and Meat Processing, Second Edition. CRC Press. p. 599. ISBN 9781439836835. ^ Laudan, Rachel (September–October 2010). "In Praise of Fast Food". UTNE Reader. Retrieved 2010-09-24. Where modern food became available, people grew taller and stronger and lived longer. ^ Laudan, Rachel (September–October 2010). "In Praise of Fast Food". UTNE Reader. Retrieved 2010-09-24. If we fail to understand how scant and monotonous most traditional diets were, we can misunderstand the “ethnic foods” we encounter in cookbooks, at restaurants, or on our travels. ^ Laudan, Rachel (September–October 2010). "In Praise of Fast Food". UTNE Reader. Retrieved 2010-09-24. For our ancestors, natural was something quite nasty. Natural often tasted bad. Fresh meat was rank and tough, fresh fruits inedibly sour, fresh vegetables bitter. ^ Laudan, Rachel (September–October 2010). "In Praise of Fast Food". UTNE Reader. Retrieved 2010-09-24. ^ Michael Pollan (15 May 2013). "Some of my Best Friends are Germs". New York Times Magazine. ^ "Western U. S. Food Processing Efficiency Initiative". STAC – Project Information Center. Archived from the original on 2008-05-17.